As one of the most indispensable parts in family medical bag, the forehead thermometer plays a key role in the whole family healthy. Not only providing more tender loving care for your family, but also the next five best forehead thermometers are professional and are able to get reading accurate readings in just seconds. 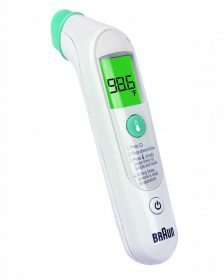 The new Braun Forehead Thermometer is fast, gentle and easy to use–simply swipe the thermometer diagonally on the forehead to get accurate readings in just seconds. 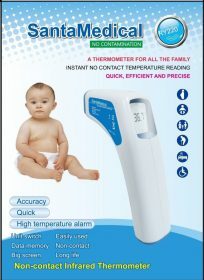 Its large, easy-to-read screen helps determine the severity of your child’s temperature by displaying green if there is no fever, yellow if there is a slight fever, and red for a high temperature. The FHT1000US is safe to use on all members of your family. So take one back home now. 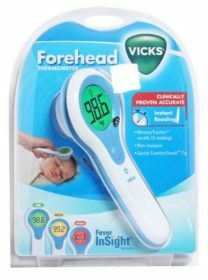 The Vicks forehead thermometer, non-invasive, is suitable for use even on your sleeping baby. While accurate, it doesn’t wake babies up. The fever insight color display system helps you better understand the meaning of your child’s temperature, on condition that you use it correctly. You should try to make sure that you keep it flat on the forehead. This is the point. It works great all the way. 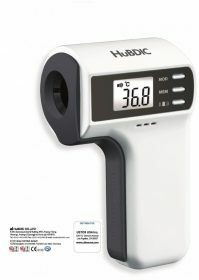 The professional non-contact infrared thermometer is designed specifically for forehead temperature detection from a 1″-4″ (5-15cm) distance with an 89-109 F (32.0-43.0C) temperature range. As a decent item, it is clinically calibrated to convert the forehead temperature reading (external surface) into internal body temperature which is one of the most important vital signs for human being. With one-year warranty, the surprising thermometer can store 32 temperature readings for future reference. It’s definitely a must-have in your home for the sake of healthy. 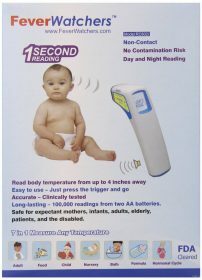 Forehead/temporal-type thermometer measures body temperature from the forehead/temple area within less than two seconds without skin contact, reducing discomfort caused by skin contact or ear insertion as well as the risk of virus infection, especially for babies. What’s more, it shows results in both Celsius and Fahrenheit. In addition to checking body temperature, temperature measurement of bathwater, formula bottle, food and room temperature are also available. What an amazing article! The FeverWatch IR thermometer features an intuitive guidance system to secure positioning and confirm accurate readings. Temperatures (Fahrenheit or Celsius) are displayed on a huge back-lit LCD screen for easier reading even in total darkness. Adjustable audio alarm will alert you if the temperature is too high. Since there is no contamination risk, one can immediately start again to scan the temperature of other family members or individuals without having to disinfect or changing the tip.